Cardinal airplant, photographed at Arthur R. Marshall Loxahatchee National Wildlife Refuge, Boynton Beach, Palm Beach County, in March 2017. We might be looking at a plant that will be eaten into extinction. Not by us, of course, but by the Mexican bromeliad evil, er weevil. Cardinal airplant, aka Tillandsia fasciculata var. 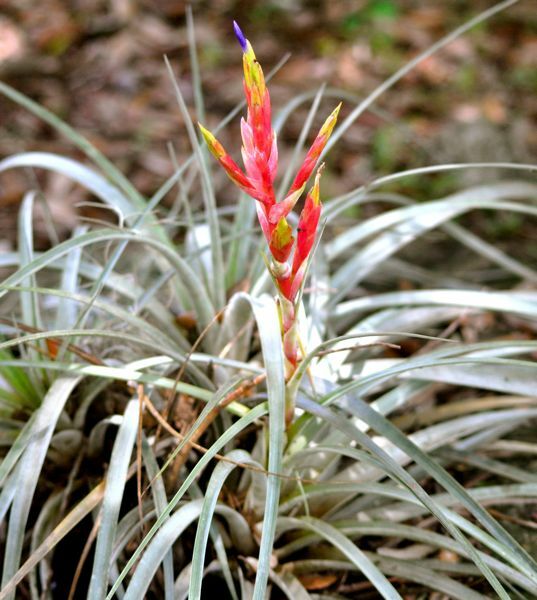 Densispica, is one of Florida's 16 native bromeliads. 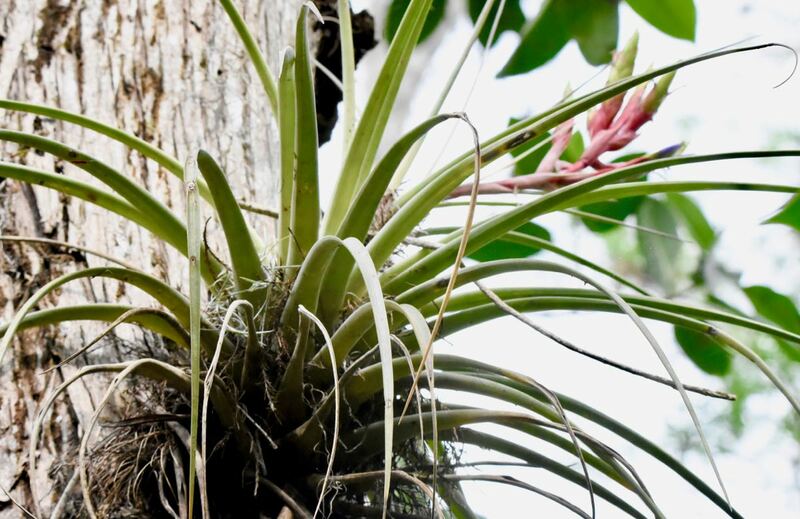 It is an epiphyte, or airplant, meaning it usually grows on the trunk or branch of a tree but is not a parasite. Instead, it takes in nutrients and water from the air and from whatever collects within its leaves. Cardinal airplant also can grow on the ground in well drained in leaf litter. 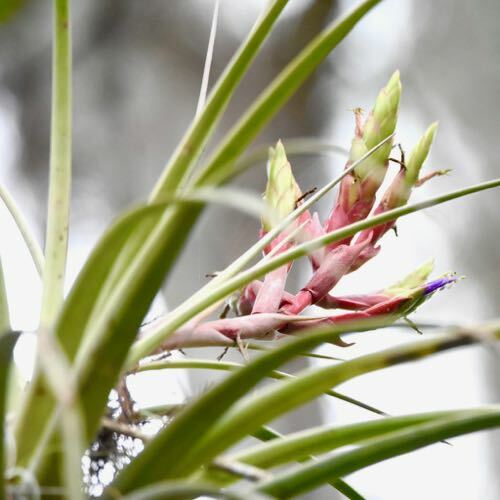 Unfortunately, 10 of Florida's 16 native bromeliads are state-listed as either threatened or endangered. That includes our guy, the cardinal. All face similar threats to their survival: loss of habitat and illegal harvesting. But the biggest threat is a bug called the Mexican bromeliad weevil, Metamasius callizona, also known as the evil weevil. Female weevils cut slits into the plant's leaves, laying a single egg in each opening. The larvae, when they hatch, begin tunneling, eating their way to the base of the plant. Adult weevils also feed on the leaves, but it is the larvae that are the most destructive. The weevils are a particular problem in Florida because they have no natural enemies here, nothing to check their growth and spread. Attempts to use biological controls have failed to date, though research continues into other methods. There are actually three plants that go by the name cardinal. All three are members of the same species, but they're sufficiently different from each other to be classified as different varieties. The type called Fasciculata might be the rarest in Florida. According to the Institute for Regional Conservation, it might be extinct in the wild, although it is cultivated. Our guy, Densispica, is the most widespread of the three, with a native range that extends as far north Volusia County, southward through the Peninsula into the Keys. Florida classifies it as endangered. The third variety is called Clavispica (common names: clubspike cardinal plant, giant airplant) , and it too might be extinct in the wild. The native range of both Clavispica and Fasciculata are restricted to Miami-Dade and Monroe counties. All three are found elsewhere within or around the Caribbean basin. Cardinal airplants are large as bromeliads go. A plant can grow to 12 to 18 inches tall, twice that when in bloom. It has long, arching leaves that are thick at the base and taper to a point at the tip. The effect vaguely resembles a pineapple. It is a tank epiphyte, meaning the leaf bases serve as reservoirs where water, dead insects and dirt and debris collect. Special cells absorb the water and nutrients. In the spring, summer and fall, it will send out tall flower spikes tipped with multiple blooms that are almost rainbow like in their range of colors, reds, yellows, greens and blues. The fruit is a capsule filled with silky seeds. In places, they're used as Christmas ornaments. Habitats include hammocks and swamps. The variety Densispica is also commonly known as stiff leaved wild pine. All three cardinal varieties are member of Bromeliaceae, the bromeliad family, which includes Spanish moss and pineapples.